All Star athletes, their parents and coaches talk about what All Star really teaches and how being a part of a team impacts lives and prepares athletes for their future endeavors. What does The USASF do to ensure All Star is safe for athletes to train and compete? The USASF, thanks to the generous support of our sponsors, has awarded more than $250,000 since 2008 to member athlete leaders with college aspirations. Learn more. What is Worlds? 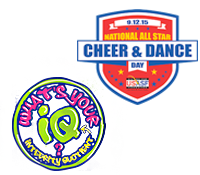 Are you on a team with a goal of getting to The Cheerleading and Dance World Championship this year? Or do you just want to share the excitement of the pinnacle All Star event of the season with everyone you know? Share these videos on your website and in social media to get motivated! The cheer and dance athletes let us know what their coaches have tuahgt them while participating on a cheer/dance team. *Videos may not be edited or in any way altered from the original content and format.